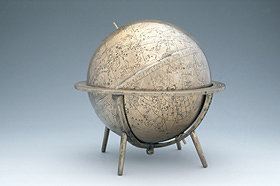 This globe shows a view of the stars from ‘outside’ the universe and was probably used for teaching purposes. The stars are represented by inlaid silver discs, their sizes corresponding to the magnitude of the stars. The axis of the globe can be adjusted for various latitudes in the northern hemisphere. The constellations appear to have been drawn according to the ‘Book of the Fixed Stars’ of ’Abd al-Rahman ibn al-Sufi (903-986 A.D.), one of the greatest of the Muslim astronomers.